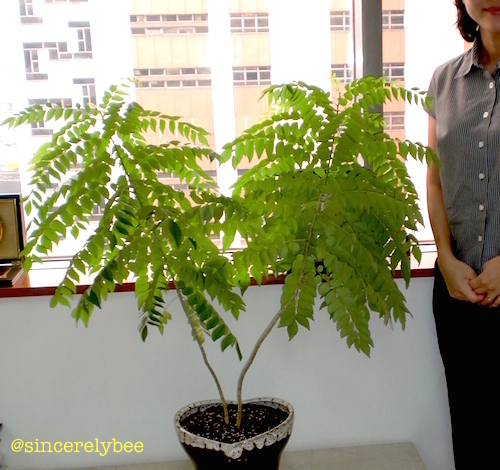 LAST WEEK, LAWRENCE (one of our local staff) brought us a pot of curry plant. 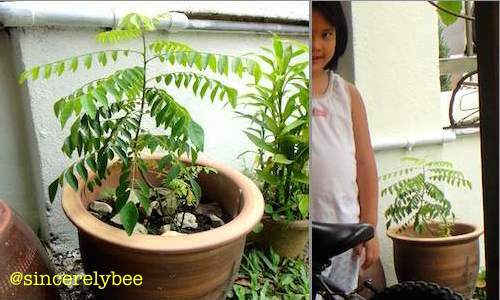 He had transferred it from another staff’s home, re-planted and cared for it while we were sorting out our home. Seeing the plant brings back a flood of memories from our days in Moscow, Hong Kong and home. I can’t begin to stress how important curry plant is to our lives; suffice to say it’s an important ingredient to our home-cooking and entertaining as well. We’ve kept one (we try) wherever we were. Sad but true, I once measured my life achievement to the survival of the plant! And being able to do that in extreme-weathered Moscow was indeed an achievement! I was even able to grow some 10 little plants to give away to friends and neighbours by the time I left Moscow at the end our 3-year stint in February 2008. 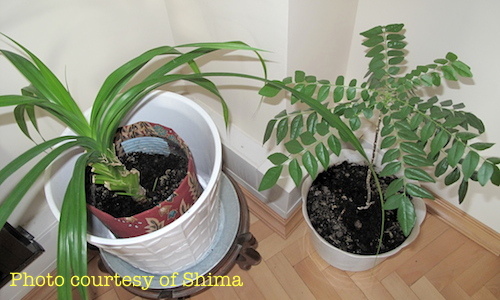 Shima who inherited a pot of curry plant and a pot of pandan plant from me, emailed me a photo in 2009; while another tree followed its new owner, Kathrin to Germany! 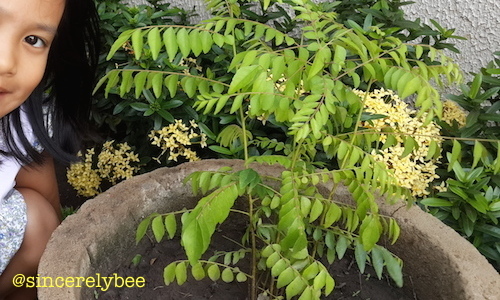 Kathrin emailed last month a photo of her curry plant sitting in her lush garden, with a message “I really do my best, but I’m afraid our climate is not what the plant expects”. I think she’s done a great job the very fact that the plant is still alive (after SIX years), having made the journey from Moscow, crossed Polish borders into German soil! Our numerous curry plants in Moscow, January 2008. 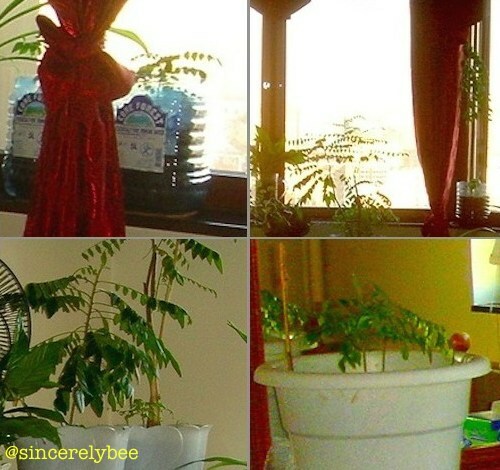 Photo of the pandan and curry plants emailed by Shima in August 2009. 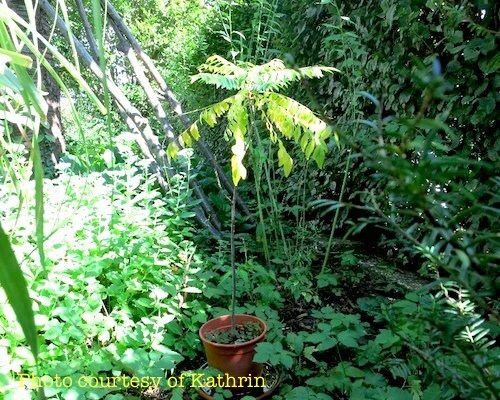 The curry plant we gave Kathrin in 2008 that eventually followed her home to Germany (photo emailed to me in August 2014). Our curry plant in Hong Kong, August 2010. It grew so healthily, parting with it was hard to do! Our curry plant in Accra, September 2014. Our next “mission” is to get hold of a pandan plant (screwpine). If we could successfully keep one alive in Moscow, I think we will do fine in Accra that has similar weather conditions as Malaysia. Speaking of pandan, when we were based in HK, I “smuggled” in a pandan plant from Hainan, China. I recall the Chinese immigration eyed my hand carry very suspiciously. Thankfully the “C” on our baggages stood for “Consulate” and not “Criminal”!!! While I successfully brought it home to HK, sadly, it didn’t survive long. This entry was posted in African Adventures, Forever Friends, Happy at Home, Heavenly Hong Kong, Memories of Moscow and tagged Accra, Friends, Ghana, Home, Hong Kong, Moscow, Russia. Bookmark the permalink.